The rebuilding of the Toronto Maple Leafs has begun. The Leafs traded defenceman Cody Franson and forward Mike Santorelli on Sunday to the Nashville Predators in exchange for a first-round pick, prospect Brendan Leipsic and soon-to-be-free-agent centre Olli Jokinen. According to TSN Hockey Insider Darren Dreger, the deal came together Saturday night with the Predators including Jokinen as a way to free up some money. Dreger says Toronto will likely trade him as well. Franson was Toronto's best trade chip ahead of the March 2 deadline as he's a pending unrestricted free agent. The right-handed-shooting blue-liner topped the rental market around the NHL. Santorelli, a versatile forward, was on a one-year contract and wasn't expected to be back, either. The trade leaves forwards Daniel Winnik and David Booth as the remaining Leafs expected to be dealt in the next couple of weeks. Jokinen, 36, could join them on the way out. The first-round pick the Leafs got in the trade is in this year's draft. With 82 points, Nashville is atop the league, so it is expected to be a late-round pick, depending on the playoffs. In Leipsic, a 20-year-old Winnipeg, Man., native, the Leafs get a 2012 third-rounder to begin re-stocking on prospects. 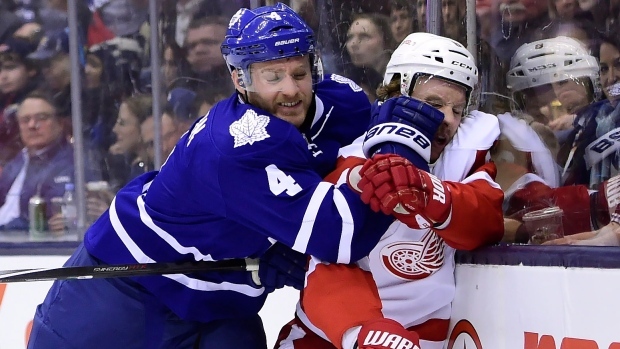 Franson, who was on his second straight one-year contract with Toronto after a contract dispute in the summer of 2013, said last week there was no bad blood between he and the organization. Going into the season with free agency pending, the Sicamous, B.C., native knew getting traded was a possibility. "It's a part of the business," Franson said Feb. 9. "At the end of the day it's a numbers game and they're going to make choices that they feel is best for the team." Franson, 27, has six goals and 26 assists in 55 games this season, and those 32 points are tied for 18th among defencemen. Santorelli, 29, had been enjoying a strong season on a similar one-year contract after some success under John Tortorella with the Vancouver Canucks in 2013-14. A shoulder injury ended that season, but he was healthy and producing in Toronto with 11 goals and 18 assists. "Honestly I think my game's kind of taken a step forward since last year," Santorelli said last week. "Last year was definitely a big bounce-back year for me. I think I've carried it over and gotten better. That's the mind-set. I just want to keep getting better." Santorelli had been playing with Winnik and impending restricted free-agent centre Nazem Kadri on the Leafs' new-look top line. Predators general manager David Poile didn't want to wait until the deadline to get his team ready for the stretch run. "In preparation for the 2015 playoff run, our goal was to add a veteran defenceman who could play in all situations and a proven forward who could move up and down lineup based on the situation," Poile said in a statement. "We were fortunate to do this in the same transaction with players who are in the prime of their careers more than two weeks before the trade deadline in order to give them more time to contribute and gel with their teammates." Both players were originally Predators draft picks.